1. Lightly toast the crumpets on both sides, either under the grill or in the toaster on a low setting. 2. Spread a tsp of tomato purée over the top of each crumpet. 3. 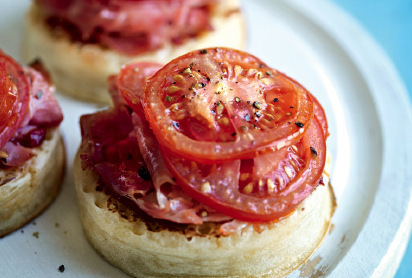 Trim any extra fat off the ham and add 1 slice to each crumpet. Arrange the sliced tomato on top. 4. Grill for 2-3 minutes to warm through, and serve straight away. Swap tip: Try using English muffins instead of crumpets for a change – you’ll only need 2 of them, sliced in half.